I am sure you have all by now seen reports of Congressman John Murtha's press conference calling for the U.S. to get out of Iraq . I was so overjoyed to finally hear someone in government say what he said that I looked up the entire statement -- it is only one page in length -- and am pasting it below. Too bad we are not hearing this kind of call from John Kerry or Hillary Clinton. "I like guys who've never been there who criticize us who've been there," Murtha said. "I like that. I like guys who got five deferments and never been there and sent people to war and then don't like to hear suggestions that what may need to be done." Until now I did not know much about Murtha, other than that he was generally considered a full-on Democratic hawk, but I think I like the guy. He is a tough ex-Marine who lists his profession on his Congressional website as "Car Wash Proprietor" (the Johnstown Minute Car Wash). Speaking of the Vice-President, did you see the recent Daily Show with Jon Stewart on CNN? Senator John McCain was the guest. Stewart"s opening question to McCain was, "Senator McCain is Vice-President Cheney insane?" McCain almost lost consciousness. (Washington D.C.)- The war in Iraq is not going as advertised. It is a flawed policy wrapped in illusion. The American public is way ahead of us. The United States and coalition troops have done all they can in Iraq, but it is time for a change in direction. Our military is suffering. The future of our country is at risk. We can not continue on the present course. It is evident that continued military action in Iraq is not in the best interest of the United States of America, the Iraqi people or the Persian Gulf Region. The threat posed by terrorism is real, but we have other threats that cannot be ignored. We must be prepared to face all threats. The future of our military is at risk. Our military and their families are stretched thin. Many say that the Army is broken. Some of our troops are on their third deployment. Recruitment is down, even as our military has lowered its standards. Defense budgets are being cut. Personnel costs are skyrocketing, particularly in health care. Choices will have to be made. We can not allow promises we have made to our military families in terms of service benefits, in terms of their health care, to be negotiated away. Procurement programs that ensure our military dominance cannot be negotiated away. We must be prepared. The war in Iraq has caused huge shortfalls at our bases in the U.S.
Much of our ground equipment is worn out and in need of either serious overhaul or replacement. George Washington said, “To be prepared for war is one of the most effective means of preserving peace.” We must rebuild our Army. Our deficit is growing out of control. The Director of the Congressional Budget Office recently admitted to being “terrified” about the budget deficit in the coming decades. This is the first prolonged war we have fought with three years of tax cuts, without full mobilization of American industry and without a draft. The burden of this war has not been shared equally; the military and their families are shouldering this burden. I believe before the Iraqi elections, scheduled for mid December, the Iraqi people and the emerging government must be put on notice that the United States will immediately redeploy. All of Iraq must know that Iraq is free. Free from United States occupation. I believe this will send a signal to the Sunnis to join the political process for the good of a “free” Iraq. To create an over- the- horizon presence of Marines. Nice blog, covers a lot of disparate ground, really quite interesting. So far as Murtha, I admire him, but not unduly. The entire debate about Iraq seems to suffer from severe reality-dislocation. 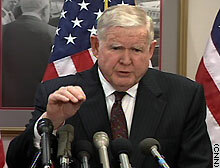 Murtha says, paraphrasing, "We accomplished what we set out to do--deposed Saddam, captured or killed his cohorts. Job well done, job finished." Oh, really? I am not aware that our "job" in Iraq was ever well-defined. Even now we bandy words around like "success." One is tempted to give up on all the standard and very hazy ideas about success in Iraq--that we will, for instance, help them constitute a stable democracy, and then, at last, graciously, stand aside. In the face of the relentless sectarian violence, one is tempted to wonder, "How in the world did Saddam ever make it work?" The answer to that is not palatable to us. He used the Iron Fist. So we are in quite a moral dilemma. We have unleashed the demon of sectarian violence. Are we willing to resort to Saddam's methods to quell that sectarian violence? If so, if we are willing to use the Iron Fist, if we say to ourselves, "Well, our ideals are really good--democracy, and all that--but the reality is that by hook or by crook we now aim *only* at reducing the number of daily casualties from the current '100 per day' to the '1 per day' Iraq enjoyed under Saddam," well, then it's time for military governorships in every province in Iraq, and it may well be time to reconstitute the Sunnis as the one and only governmental force in Iraq. They may be the only ones ready to bring the Iron Fist down hard enough and long enough to quell the violence. In other words, Saddam was right. He told the world, "If you want to stop the violence, put me back in power." But we not only allowed, we encouraged, the Shiites to execute him. The blood lust is upon them. If we leave now, pull out our troops, Iraq will soon dissolve into provinces governed by ruthless warlords. Other countries, like Iran and Saudi Arabia, will forward their conflicting interests, supporting this or that warlord. It will be the Iron Fist all over again, but the bloodletting will not soon stop. Saddam's Iron Fist will seem like a velvet glove by comparison. Were Shiite pilgrims ever attacked by suicide bombers, under Saddam? Were renowned Shiite mosques ever blown to smithereens, under Saddam? Did he kill thousands of his own people? Yes. Did he use a secret police to torture and imprison hundreds, or thousands, of people? Yes. Are Americans prepared to use the methods of Saddam to put the demon of sectarian violence back into its bottle? No. We unleashed the demon, but we will not do what it takes to bring it under control. So we are in an insoluble dilemma of our own making. Is there nothing we can do, then? One can't help but think there is a shred of a chance for our so-called "surge" to succeed. But what, exactly, is success? Naturally, the realists mumble something about lowering our expectations. But let's spell it out. I say, a Shiite-ruled Iraq is a recipe for ongoing disaster. We will have to insist upon a government which enfranchises the Sunnis, and the Kurds, giving each group some meaningful autonomy and oil revenues. We will in effect guide Iraq into a condition which will resemble my conjectured future, above, of its dissolution into warlord-led nation-statelets. I cannot imagine any international force whatsover which will be able to assume the burden of keeping the peace between these factions. The factions will inevitably ally themselves with other nations, such as Saudi Arabia (the Sunnis) and Iran (the Shiites). This too is a disaster. Hmm. I can't say I've hit upon a viable "solution." In fact, no matter which scenario I imagine, in each and every one, we will look back, and Iraqis will look back, on Saddam, and say, "Those were the good old days." So how is Murtha so admirable, for, after all, he too seems in the Washington lock-step of imagining we did the Iraqis some giant favor, by deposing Saddam? The Democrats are as bad or worse than the Republicans. At least the Republicans speak their misguided minds. The Democrats won't dare utter a word until they check the polls. If they ever do speak their mind, they rush to apologize. Obama said the lives of our 3,000+ killed in Iraq were "wasted." Which is what he himself believed; or there was at least a locus of honesty in his statement. But, his eyes on the polls, he was quick to retract the politically-dangerous statement. No, the Democrats lined up like sheep to sign on to the resolution approving Bush's invasion of Iraq. The scope of their idiocy is so great that they cannot even see it. They are poll-mongering sheep who flock beneath the banner of the politically correct. So. just a few remarks. Great blog, though.